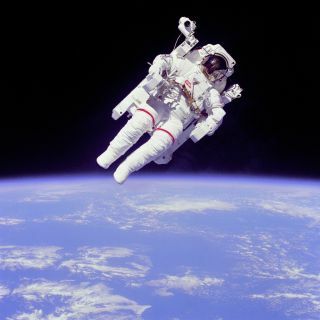 NASA astronaut Bruce McCandless II ventured further away from the confines and safety of his ship than any previous astronaut ever has when he tested the Manned Manned Manuevering Unit or MMU, a nitrogen jet propelled backpack, during a 1984 space shuttle mission. Becoming an astronaut doesn't just happen overnight. It takes many years of education and experience to meet the basic qualifications. Many people aren't accepted on the first try, either, requiring them to learn more to be better prepared for the next try. Even then, only a small percentage of applicants become astronaut candidates, making it a hard job to get. "The fact that I applied to become an astronaut 15 times has not been lost on my friends, followers, or fans," wrote retired astronaut Clay Anderson in his biography, “The Ordinary Spaceman,” as quoted in Popular Mechanics. "Jokes and snide remarks have hinged upon the ugly truth that on 14 of those 15 attempts I was a complete and abysmal failure. As a matter of fact, there's a NASA public service announcement highlighting how it took me 15 tries. I like to cling to the reality that I can always say 'better late than never,' but at this point it's all academic." The first step to being an astronaut is getting relevant experience in school. There are two main classes of astronaut applicants: military applicants and civilian applicants. Military application procedures vary depending on the branch of the U.S. armed forces you are working for, since you apply through your respective branch. Civilians apply to NASA directly. No matter the background, NASA wants its astronauts to have at least a bachelor's degree in engineering, biological science, physical science or mathematics. (The agency maintains a list of exceptions to these degrees, such as geography or aviation management.) Many astronauts have a master's degree or even a Ph.D. in their field. Some astronauts, such as Story Musgrave (now retired), have degrees even beyond that. While education implies you'll need some money to make astronaut selection possible, a Forbes article points out that several astronauts received assistance from the military or government programs to pick up qualifications. "Kids that could never have afforded the education needed were assisted by government programs, whether that be military, federal, or state," said NASA employee Robert Frost, responding to a question on Quora. "With that help and working very, very hard, they got educated and got good jobs where they were able to show their capabilities in a way that impressed the astronaut selection committee. Sometimes determination needs a helping hand." It takes more than school to gain a foothold as an astronaut selection candidate, however. NASA wants at least three years of "related, progressively responsible, professional experience" or (in a nod to military candidates) at least 1,000 hours of "pilot-in-command time in jet aircraft." Advanced degrees are considered equivalent to this experience, however, with a master's equaling one year of experience and a doctorate three years of experience. A notable exception to these requirements are teachers, who still must have a technical bachelor's degree but can qualify through the act of teaching — even for elementary school children. In general, you must be in extremely good shape to be an astronaut as it's expensive to make an emergency return to Earth in case of medical emergency in orbit. There also are interviews during the selection process to figure out if a candidate is physically and psychologically able to work as an astronaut. Flexibility, group work skills and a love of learning are some of the personality traits NASA looks for. After graduating, many astronauts are not assigned to a flight for years. They will back up other astronauts in orbit through serving as a "CapCom" in Mission Control, doing simulated spacewalks in NASA's Neutral Buoyancy Laboratory and picking up more skills they will need for their time in orbit. They spend time not only at NASA, but also international partners with training facilities (such as Canada, to learn how to operate the station's robotic arm.) All astronauts also must maintain flight proficiency on T-38 aircraft, flying a certain number of hours per month. Once an astronaut is selected for a flight, the mission training takes another couple of years. They start by reading textbooks and receive classroom training, then do simulation after simulation to learn the stuff for real. Their training takes place all over the world, both individually and with their crewmates. "Several full-scale mockups and trainers are also used to train astronauts. These mockups and trainers are used for onboard systems orientation and habitability training. Astronauts practice meal preparation, equipment stowage, trash management, use of cameras, and experiment operations," NASA stated. A typical spaceflight these days for a NASA astronaut lasts six months on the International Space Station, but some astronauts are now being assigned to year-long flights to learn more about the human body. Science will take up most of an astronaut's time in orbit.